More than a year has gone by since the overthrowal of Viktor Yanukovich, the starting point of a severe international crisis between Moscow and the West, successively escalated by Russia’s annexation of Crimea, and the outbreak of a separatist war in the Donbass. While any talk about “winners” and “losers” in such crisis would be superficial and over-simplistic, the unfolding strategic situation, especially since the ceasefire agreement of February 11, deserves some attention. Considering Russia’s interests in the region, particularly if those are to be understood according to the Russian geopolitical and strategic vantage point, Moscow has managed to protect some of its vital interests, succeeding in three main dimensions. Firstly, the non-violent takeover of Crimea, albeit clearly illegal under international law, has secured the country’s access to the Mediterranean and to the Middle East, eliminating a serious point of contention with the Ukraine, and a lethal threat to Russia’s projection capabilities. The move also subtracted the peninsula from NATO’s encroachment, allowing instead a significantly more secure Russian hold in the Black sea region. Secondly, Russia has effectively avoided international and diplomatic isolation. Despite Beijing’s endorsement of traditional conceptions of sovereignty and territorial integrity, China has de facto sided with Russia, going to the extent of signing a $400 billion worth gas deal during the crucial weeks of the Crimean crisis when the US and the EU launched their sanctions, in a clear political gesture towards Washington and the rest of the world. India, Brazil, Turkey, Iran, Israel, Korea and numerous other nations have been taking little if no action against Russia in the wake of the crisis. Thirdly and perhaps most importantly, the secessionist conflict in the Donbass has provided a sure way for Russia to heavily intervene, practically for an indefinite future, in Ukrainian affairs. There is no indisputable evidence that President Vladimir Putin is trying to expand the borders of the Russian state by means of re-unifying or annex parts of the former Soviet Union, but several elements, both ideological and geostrategic, point to that direction. If so, it would appear that Russian actions in the Ukraine aim at the disintegration of such state at least in three regions (the fourth, Crimea, is already in Russian hands): the West (Galicia), the Centre (Malorossiya), and the East and South (Novorossiya). Ideally from the Kremlin’s perspective, the Ukraine should become some sort of federation, from which the various autonomous regions would gradually secede and shift towards East, with the exception of Galicia, for which Russia has no interest. Russia is trying to achieve the disassembly of the Ukrainian state in the least expensive way, i.e. mostly by relying on the gradual collapse of its economic and governance structures, rather than resorting to financially, militarily, and politically far more costly radical options. The Ukraine is, alongside with other former Soviet republics already in the Russian sphere of influence, probably the country where Russian intelligence networks are most widespread, and active. This is not surprising considering the history of the country, the presence of vast Russian ethnic minorities, the difficulty itself of tracing a clear Russian/Ukrainian identity divide, the economic and strategic nexuses. Moscow bets on the Western inability and unwillingness to keep the Ukraine afloat indefinitely and at any cost, and readies itself to the moment in which, the breaking point in Kiev having been reached, further agitations in key regions (Dnepropetrovsk, Kharkov, Odessa), will be activated. The current ceasefire appears in this picture particularly favourable to Russia. It provides political recognition of the separatists, allowing for the consolidation of their positions. It forces Kiev to indirectly admit its defeat in a campaign which has been a major military debacle, leaving open all political questions not only about the future of the Donbass (home to some 20% of the country’s pre-war GDP), but more in general of the constitutional ordering of the state. As a “frozen conflict”, the situation in the region remains a sword of Damocles pointing to any future government in Kiev. The immediate effects of the ceasefire have been a recrudescence of hostilities among the various factions constituting the Ukrainian ruling elite, as made clear by the Kolomoysky standoff in Dnepropetrovsk. The war has been a disastrous adventure, but it has also helped the postponing of a series of questions, particularly concerning the reconstruction of political representation for the Eastern part of the country within some sort of common national identity, after the liquidation of the Party of Regions. Russia counts on the difficulties that will certainly emerge from this comeback. Indeed, the Russian media have often insisted on the presence of openly fascist movements and people at the helm of the Ukrainian state. Such presence may have been exaggerated, but on the other hand, there are only scant possibilities for a Ukrainian “democracy” to function, since previous attempts have not really functioned to the benefit of the country in the first twenty-four years of its independence. Paradoxically therefore, a “fascist” Ukraine, i.e. one which relies on strong nationalist rhetoric with the exclusion and oppression of vast part of the non-complying (Eastern and Southerner) population, may constitute one of the few realistic options for the future of the Ukrainian state in its current borders. The Ukrainian leadership has embarked in a war to crush the insurgence in the East, but without gaining any meaningful military and political advantage so far. It would be arguably very difficult to disengage from such strategic initiative without severe consequences. In this perspective, Kiev has a clear interest in the prosecution of the war in order to resume its attempts to crush the insurgency. On the other hand though, it has very little realistic chance to prevail against the rebels and the colossal amount of resources which Russia is pouring into the conflict. There are few options left open to Kiev. It is questionable to what extent it is possible to imagine the complete eradication of Russian influence in the country, left alone the complex web of century-old relations between Russia and the Ukraine. Accepting the permanence of a frozen conflict is likely leading, as mentioned above, to the further disintegration of the Ukraine’s territorial integrity. The other option is to use the current ceasefire as a pause to re-group and re-arm, in the view of a renewed offensive against the separatists. In the logic of the preservation of the Ukraine’s territorial integrity, this appears to be the most likely scenario for Kiev. In that, it certainly enjoys the support of at least certain sectors of the US and UK leaderships, who appear to have embraced the course of a proxy confrontation with Russia. This is reflected in the large scale military equipment deliveries which are apparently taking place. However, a resumption of hostilities would open a series of questions. The calculation may be that, if Russian forces cannot be defeated in a limited war, overstretching them by opening multiple fronts may lead to a collapse of the Russian regime. This strategy is largely indebted to a reading of the Cold War’s end according to which it was a combination of US initiatives to stretch Soviet resources (Reagan’s arms race, support for the mujahedeen in Afghanistan), which brought about the collapse of the USSR. More in general, identifying parallels between the USSR and Putin’s Russia has become a major Kremlinological genre. This reading is however simplistic as it underestimates the role of domestic factors in the USSR implosion, particularly its economic and social model, and does not capture the very different situation of today’s Russia, and the international environment. Russia in its current borders can hardly be considered overstretched in historical terms (the contrary may be true), and it is much more interconnected with the world economy. Being far less powerful than the former USSR, it has fewer foes. Russia is globally weak, but regionally very strong. Moreover, while the Communist elite was willing to transition towards an immediately available alternative system back in the late 1980s, currently there are no alternative paths for the neo-imperial Russian elite in this global post-democratic context, as both the social-democratic model which inspired Gorbachev’s perestroika, and the neo-liberal orthodoxy, are in tatters (everywhere). Among the apparent brokers of the second Minsk agreement were also German Chancellor Angela Merkel and French President François Hollande, although it is especially the Germans who have been working on some kind of compromise between the various parties. Germany’s position is problematic to the extent to which is focused on the achievement of a “political” solution which, in the absence of a clear territorial demarcation in a conflict which is mostly about land, cannot be given. The crisis in the Ukraine is causing a double movement in Europe. On the one hand, there is a principled reaction for the defence of the Ukraine’s sovereignty and territorial integrity, which is officially not disputable. On the other, there is a process of “normalisation”, whereby, step by step, Berlin and other Europeans chancelleries are accepting the fait accompli of Crimea’s annexation, and the consequences of the military conflict in the Donbass. The push for a more belligerent stance towards Russia coming from Poland, the Baltic states, the UK and the US has recently been resisted by Berlin, which has even openly contested NATO statements concerning the scale of Russian involvement in the conflict, and criticised those who appear to be setting Europe on a military collision route with Russia. The German position is understandable, but it is also weak and bound to remain in a prolonged state of weakness. The Germans have based their entire foreign policy, particularly after 1991, on a series of conceptions, which are now rapidly becoming untrue or untenable, namely: 1) Germany is surrounded by friendly nations and/or allies, thus it does not need to be overly concerned about security in a traditional sense; 2) Russia will be indefinitely weak and irreversibly in decline; 3) the US and other allies will never drag Germany into a major war; 4) the task of the Bundeswehr, as well as of the German foreign policy makers in general, is to support humanitarian, peace-keeping, and/or stabilisation missions, with a limited deployment of men and equipment. The consequences of this line of thought have been the reduction of the German military, particularly of its ground forces, to a severely underequipped (as admitted by the Federal Minister of Defence), very small army, which in no way can constitute a valid deterrent for the protection of borders of allied nations in Europe. 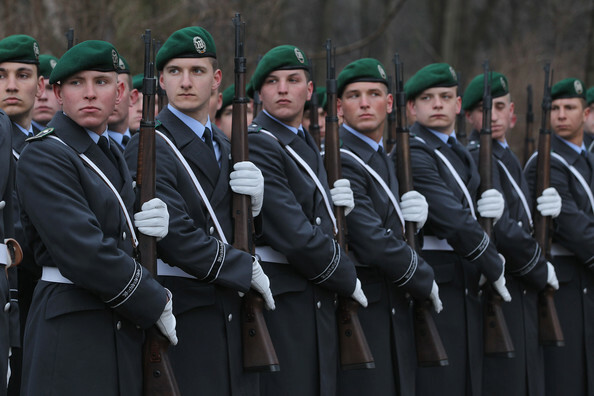 However, because of the prevalent political culture in Germany, it is extremely unlikely that there will be any reconstruction of a credible military. This situation is unfortunate because the unmet security of the Baltic states, of Poland and other border regions will make them unstable and therefore more exposed to the risk of a conflict with Russia. This remains true (perhaps even more) in the perspective of (admittedly speculative) German alignment with Russia. A weak Germany encourages more Russian military initiatives towards Europe, and condemns Berlin (and most of the EU) to a path leading towards its disappearance as an historical force. The President of the EU Commission Jean-Claude Juncker seems to be hinting at this problem with his recent proposal for the creation of a European army. However, in order for Germany/Europe “to be taken seriously”, European “values” need to be updated to something worth the sacrifice of enduring the political Ernstfall. Can someone conceivably be demanded to kill and die for the EU flag? The military weakness of Germany has become even more relevant when considering the nature of combat operations in the Ukraine. Instead of a high-tech battlefield of thin but flexible, highly trained professional forces backed by air force (the main military concept in past decades), the Donbass war has underscored the importance of infantry, artillery and armoured vehicles operating in an environment where advanced anti-aircraft systems effectively impede the intervention of air forces (even helicopters). This however limited conflict has seen the deployment of approximately 42,000 Russian troops in various roles according to some studies, and possibly up to 30,000 separatist fighters, which combined are more than the whole of the German ground forces (69,000 troops). In conclusion, despite the current ceasefire, the chances of a stable solution of the conflict remain small. A rather optimistic outcome scenario would be that of yet another “frozen conflict” in the post-Soviet space, though many elements speak against it: the economic importance, size, and population of the territories involved, and their centrality in the context of a much broader geostrategic confrontation. Alternatively, the conflict may resume until one of the contenders will achieve its goals. Despite stating the contrary, Russia has territorial ambitions, although they may be articulated, at least provisionally, in the carving out of further de facto states. It is unclear where the limits of such ambitions lie. Kiev and its Western allies have been gradually abandoning the limited goal of the Ukraine’s territorial defence, and are confronted with the decision to escalate in the context of a broader attempt to destabilise Russia. This gamble may however be based on unrealistic estimates of the forces on both sides, and of what is actually at stake. Germany and other EU states, are unable to pursue an effective policy of military intervention and/or deterrence, in consequence of strategic miscalculations made in the post-Cold War environment, dictated by an inadequate background political and strategic culture. Being unwilling and unable to change it, they will continue to engage in the construction of self-delusional narratives of the crisis, suiting their impotence. Roberto Orsi is a co-investigator on the Euro Crisis in the Press project. He holds a PhD International Relations and is currently member of the Security Studies Unit at the Policy Alternatives Research Institute (東京大学政策ビジョン研究センター), and lecturer at the Graduate School of Public Policy (GraSPP – 東京大学公共政策大学院) of the University of Tokyo (Japan). His research interests focus on international political theory, history of ideas (particularly modern continental political philosophy and critical theory), political theology (Carl Schmitt). He is also interested in social science epistemology and classical philology. This entry was posted in Europe, Germany, Roberto Orsi, Russia, Ukraine and tagged Bundeswehr, Crimea, Donbass War, EU army, Jean-Claude Juncker, Minsk 2. Bookmark the permalink.